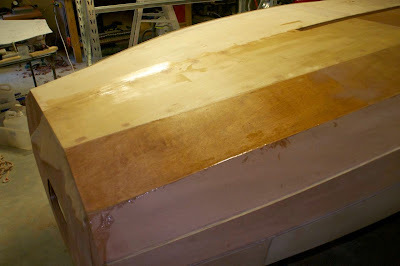 I spent a few evenings prepping the hull for fibreglassing. This basically consisted of sanding back the rough edges and filling holes with filler, then repeating the exercise a couple of times until I was reasonably happy things were fair. I bought 10m of 135gsm fibreglass, and laid it in two strips either side of the centreboard case, with a little overlap where the keelson will end up. Here's the first side placed. It was quite a bit easier than I anticipated. 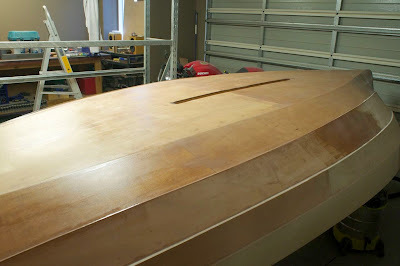 Just lay the fibreglass on the hull and pour some unthickened epoxy on top, then work the epoxy in using a plastic squeegee. 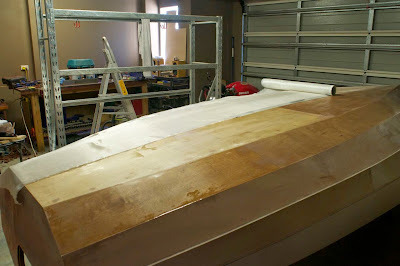 The fibreglass just lays down nicely. 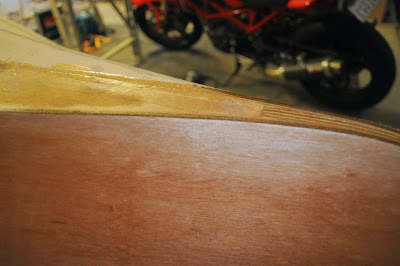 Then once the epoxy has had a little time to set up, the excess gets trimmed. The photo shows in between trimming the edge and the stern. 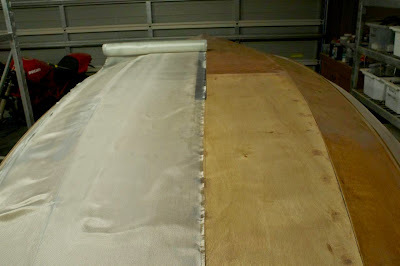 At this point the weave of the fibreglass is clear, but it's gone completely transparent. This shows it's properly wetted out and that there's no excess epoxy, which would allow it to float off the surface of the ply. The other side is done exactly the same. Lay the glass down and soak it with epoxy. Here's what the fibreglass looks like immediately prior to mixing the goop. Once both sides have set up, I coated it again in a coat of unthickened epoxy, then a couple of coats of thickened goop, thickened with micro-balloons to the point where it was still just pourable. My squeegee is the perfect tool for application, followed by the sponge roller to even out any overly thick bits. Once this has set up, I'll sand it smooth and then coat out the rest of the hull with thickened epoxy.